From harnessing the sun’s energy to generating an income stream, the latest product launch from ESE World Ltd offers both public and private sectors an intelligent solution to waste management for densely populated areas. 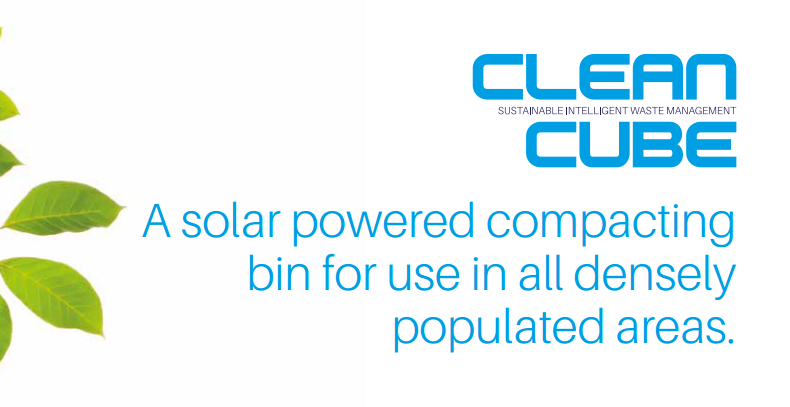 Clean Cube is a smart waste compacting bin which houses a standard wheelie bin and is powered by solar energy, it is available exclusively through ESE, Europe’s leading manufacturer of temporary storage solutions for waste and recycling materials. Clean Cube’s built-in sensor detects when the bin is full and swiftly compacts the contents, allowing it to hold up to eight times more rubbish, increasing the bin capacity by up to 700%, considerably reducing overflow and reducing waste collection by up to 85%. Intuitive linked software means Clean Cube bins are easy to manage and maintain, the software sends an alert when it reaches its capacity, reducing the need for manual handling and a helpful tool for planning route optimisation. 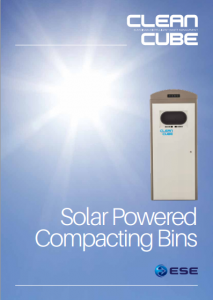 Powered by solar energy, the bins can be installed anywhere that sufficient natural light is available, making them ideal for high traffic areas such as transport hubs, leisure amenities and attractions and shopping centres. In addition, Clean Cube has the ability to generate an income stream, its backlit LED or plain panel can be used for advertising placement, which gives owners an opportunity to target ideal local businesses and organisations. Clean Cube is available in several sizes up to 240 litres. ESE World B.V. is Europe’s leading manufacturer of temporary storage solutions for waste. ESE World provides customers with the most efficient systems by combining over 75 years of experience with latest technical know-how. Its product portfolio includes a broad range of 2-wheel and 4-wheel waste containers, pre-sorting systems, collection banks, innovative underground waste collection systems and the Clean Cube compaction bin. Its products provide municipalities and waste service companies across Europe with systems which facilitate hygienic and efficient collection and also drive the recycling of waste. ESE World Ltd is part of the ESE World BV group of companies and is the UK supplier of the products produced by the group.